What we Americans call life, more often than not, consists of a routine each person has developed to allow them to deal with the specific needs of their family situation. The difference between me, and a few others like me, and the rest of America is that we have set aside time in our daily lives to educate ourselves in regards to the history and laws which govern us. Our Founding Fathers, those men who lived in ages past who secured America’s independence and established its system of government, were all pretty much in agreement that an informed public was the only sure means of ensuring that the freedom they had worked to obtain would remain for the generations that followed. I wonder what these great men would say could they revisit the country they helped establish and quiz the people who currently occupy it in regards to how much they know about our system of government and the nature of our rights. I honestly can’t say what would go through their minds when they encountered firsthand the ignorance and apathy that I myself encounter on an almost daily basis, but were it me, I’d be asking myself, “Why the hell did I waste my time when future generations would have squandered the precious gift of liberty I fought so hard to secure for them?” That’s what I’d be thinking, and I’m pretty sure the Founders would be in agreement with that sentiment. Americans today think that simply because we have a government, which from all outward appearances, conforms to the one outlined in the Constitution, and that they still have free elections, that they have freedom. People today wouldn’t recognize true freedom if it came up and introduced itself to them; worse they don’t want freedom, because it entails much more responsibility than they are comfortable assuming. 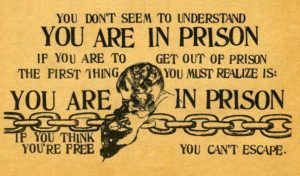 It has been my experience that not only do people not understand what it means to truly be free; not only do they not want to truly be free, but they despise those of us who actively seek to restore our freedom while attempting to educate them as to the degree to which they are not free. I guess there is some truth to the old saying that ignorance is bliss, because people sure get mighty upset when someone attempts to open their eyes and expose them to the truth. I truly believe that, if somehow, the shroud of ignorance, apathy and complacency which envelops the people of this country could be pierced, and their minds exposed to the truth, that elected representatives across the land would be hanging at the end of nooses like Christmas decorations within a week. If people could only be made to see how evil and how dominating government has become, there is a chance we could turn this country around and restore the liberty our Founders fought so hard to secure for us. Unfortunately, I don’t see that in our future; I see only things getting worse because, quite possibly, the truth has become so frightening that people are unwilling to accept that they are partially to blame for it. Had they not suffered fools and corruption in their choices of those who represent them, we may not have degenerated to the point where we are but mere serfs working the land for our government and the landowners who control said government. While there are those who are unabashedly willing to admit that they live off the government dole; handouts that were NEVER among the powers granted government by the Constitution, there are those who still truly believe in the American Dream; that if you study hard, find a good job, you can buy a nice house, nice car, and live the good life. I may not have the highest paying job in the land, but I have paid off my home and both my vehicles; yet I do not own them. I have heard people say that they finally paid off their car, or their home; that they finally own them, and not the bank. No they don’t; the government does; or to be more precise, the holders of our national debt do. If you have true ownership of something you do not have to pay taxes on that item on a yearly basis to some government agency; just so that you can continue to use that item. Yet if you refuse to pay your vehicle registration they will deny you the right to drive on the roads. If you refuse to pay your property tax they will come and try to evict you from your land. That is not true ownership; that is serfdom; the government allowing you to have these things as long as you live within the guidelines they have established for you to be able to do so. The moment you stop obeying their rules, or stop paying for the privilege of using your property; the full weight of the law comes down upon you and you will become, in their eyes anyway, a criminal. I’m sure many have never heard the term allodial title, let alone understand what one is. Allow me to enlighten you. An allodial title constitutes true ownership of real property that is independent of any superior power or landlord, and is free of any taxes and duties. Let’s use your vehicle as an example. When you finally pay off your vehicle you are given a title; which most assume decrees that they are the owner. Not so. What they have is a deed granting them permission to use, or occupy that real property. A deed that can be revoked at the whim of the true owners. When you pay off your vehicle you are issued a title, or deed, which you assume conveys ownership of that vehicle. But unless you have the Manufacturer’s Certificate of Origin, you do not truly own that vehicle. Most dealers, upon the sale of a vehicle, send the MCO to the State, that is unless you are aware of its existence and demand that it be given to you instead. But then, once you appear before the agents of government at the DMV to register that vehicle, you will be asked to surrender the MCO for that vehicle; making the State the true owner of your vehicle. The same principle applies to land ownership. You may think you own the land your house rests upon, but did you know that if they were to discover precious metals, or natural gas under your house that you are not entitled to claim ownership of those things? You do not own the land rights, or more precisely, the mineral rights to the land upon which your home rests. This is one of the big issues the ranchers in the North and the West have been facing, the government either finding natural resources on their land and setting up mining or drilling operations to obtain them, or telling them that they cannot do whatever they want with THEIR property. Let’s say you have a house, can you just up and add an extension without first obtaining a permit, (permission from the real owner)? There was a story on the news about a Huntsville Alabama man, a veteran who had served his country, who decided he wanted to live off the grid. He installed his own utilities and was free and independent of the burden of paying for electricity and water. Yet the city came in and told him he was in violation of code; that his living off the grid was unsafe and in violation of the law. Now tell me, does it sound like a person can be told that, and still be considered to be the ‘owner’ of the property they live on? In old English times when the people lived under monarchs, the King held title to all the land in the kingdom. He would allow the peasants to occupy the land, to work it and produce crops or livestock, but in tribute they would have to submit to the King taxes to ensure their ability to continue living on the Kings land. This was known as the feudal system where the people were nothing more than serfs. During these times the Kings will was absolute and, often, arbitrary. If someone did something the King did not like, he simply sent his troops to burn that person’s house down and evict them from his land. If someone became too outspoken against the King they were imprisoned, or executed even. Had you read the Constitution you may have run across the words, “We the People of the United States… do ordain and establish this Constitution for the United States of America.” If the government created by that document is actually the sovereign power in this country, why did it take an act of the people to establish it? Why could not the government just have said, “Here we are, we are your bosses now and we can make whatever laws we think you need to keep you in line”? It is because government is not our master; it is our servant. Government does not tell us what we can do, we tell government what IT can do. The things government is allowed to do are contained within the Constitution; nothing more, nothing less. The moment the government oversteps the limits imposed upon them by that document their actions become usurpation and tyrannical. It was by the sovereign authority of the people that the Constitution was ratified and our government came into existence. It is when the government created by that document oversteps the specific powers granted it that the power and authority granted it by that document can be reassumed by the true sovereigns; the people. In 1785 James Madison wrote something entitled A Memorial and Remonstrance Against Religious Assessments. In it Madison states, “The preservation of a free Government requires not merely, that the metes and bounds which separate each department of power be invariably maintained; but more especially that neither of them be suffered to overleap the great Barrier which defends the rights of the people. The Rulers who are guilty of such an encroachment, exceed the commission from which they derive their authority, and are Tyrants. The People who submit to it are governed by laws made neither by themselves nor by an authority derived from them, and are slaves. Those who hold power and authority, once firmly entrenched, are not likely to willingly surrender it. That is what Madison spoke of when he said the free men of America did not wait till usurped power had strengthened itself by exercise, and entangled the question in precedents. He realized that if the people waited till power had strengthened itself in these precedents that it would be much harder to shake off the shackles of tyranny; better to fight every single encroachment of power than to sit back and wait till things got so unbearable that you can’t take it anymore; which is exactly what we have done. A sovereign citizen is one who realizes that the supreme power in this land belongs to the people, and that when the government created for specific purposes no longer serves those purposes, and becomes tyrannical, they have the right to re-assume their sovereignty and live free of governmental interference. This does not mean they can go around violating the rights of others; only that the laws the government enacts do not apply to them, nor do the tax laws which require them to pay for things which the Constitution does not allow. Sovereign citizens are not terrorists, they are not your enemy; they are simply those who wish to live free; as our Founders intended. Let’s look at the DEA, or Drug Enforcement Agency for a moment. According to their own website, “dea.gov/docs/factsheet.pdf” the DEA employs around 9,200 people. All these people work to enforce the drug laws passed by the federal government. They can come into the States and arrest people for violating the laws our government passes in regards to what drugs are allowed, and which are considered illegal. Yet where in the Constitution does it say that the government can tell us what drugs we can, and cannot take? When the people wanted to ban alcohol they had to pass a Constitutional Amendment to do so. Then when they say the crime that sprung up when you tried to restrict alcohol consumption, they also repealed that amendment. I see no Constitutional Amendment prohibiting me from smoking a little marijuana from time to time. Yet should I choose to do so I will become a criminal in the eyes of the laws passed by my government. Explain to me, if you can, how a government can pass laws which the Constitution does not authorize them to pass; then create an agency to enforce those laws; which can arrest me, put me in jail, or kill me should I resist these unconstitutional laws; and then still have the audacity to say that we live in the land of the free. How many laws has our government passed which go well beyond the specific powers granted it by the Constitution? How many of our rights have been restricted severely by the laws which have been passed by our government? Yet you still say this is the land of the free? How can you say you are free when you do not own your right to do with your life as you please, and apply that same principle towards your property? We are slaves, or if not slaves, serfs allowed to work and live on the land owned by our landlords; that is until we step too far out of line and attempt to restore the freedom that our Founders fought to secure for us. Then the full weight of government will be brought to bear upon those who resist its authority. Is that the mark of benevolent rulers who govern according to the rule of law, or is it the exact description of a tyrant? The American people do not deserve to be free because, first and foremost they don’t even know what true freedom entails. Secondly, most do not have the desire, nor the courage, to stand up for that freedom. You’re voting for the candidate of your choice for all the wrong reasons, then you have the gall to ask why our country keeps getting worse. Even worse, people condemn me for my decision not to vote; saying I’m giving the election away to Hillary by not voting for Trump.